Welcome to our weekly post where we explain a fact or trend relating to the world of employment in under one minute. 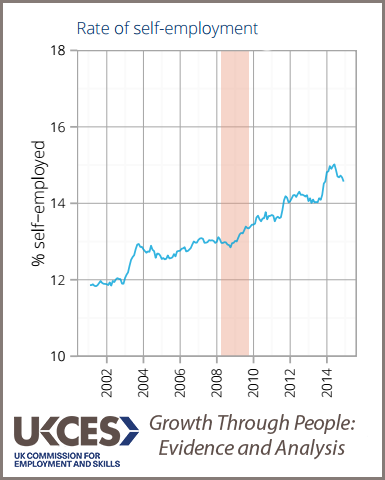 Since the recession the number of self-employed people in the UK has risen dramatically. Now, 15% of all in work are self-employed, meaning self-employment is now higher than at any point in the last 40 years. However the average self-employed income has fallen dramatically (22%) since 2008-9. This is due to the fact more self-employed people are choosing not to give up but to stick at it even when their income falls. And that may be because after the recession there are fewer opportunities available to those who try to return to regular employment. During this time the demographic make-up of the self-employed has also changed. The proportion of self-employed women is increasing but the most dramatic demographic change relates to age: among the over-65s the rate of self-employment has doubled in the last 5 years. To read more about how the labour market is changing read our Growth Through People: Evidence and Analysis report or to find out more about the self-employment boom check out the ONS’ Self Employed Workers in the UK report. Why not tell us what you think by commenting below or tweeting us (@ukces). Or, if you've got another few minutes to spare, check out our 5 most read One Minute Monday blogs of 2015.